I was going through my inbox today and came across this gem from Ben Thompson of Stratechery on “The Real Problem With Facebook and the News“. Its about the virtual neighbourhood we create and the news we consume from Facebook. The point of the article is that Facebook’s “trending news” uses a combination of algorithms and manual curation. Is this a good thing? Even if conservative stories are trending, they will push some liberal stories in the mix. They can also add stories that aren’t trending into your trending news section. There’s a bunch of things in there I would engage with. These include Steph Curry & basketball related news as I’m a huge NBA fan which Facebook knows. I’m also really into The Walking Dead having liked the Facebook page. I’d probably check out WWE and & The Predator film too. The newsfeed which you see in the middle of the Facebook screen is entirely driven by an algorithm. I presume you also associate with like minded people already on Facebook. You click on & engage with articles in your feed. Based on this behaviour and some smarts, Facebook serves up more of the same stuff. The problem is that it creates a virtual neighbourhood which reinforces your worldview. If you believe in a certain topic really passionately and associate with people that also share the same viewpoint, you only see more of it. Go to websites about that topic on the web? You’ll see more of it when you come back to Facebook as the website’s Facebook page and advertising retargets you. Your friends are probably sharing links & discussing the same view on that topic too. Similar pages and advertisers will also target you. You won’t see a contrarian view that will challenge your thinking. This virtual neighbourhood polarises us further away from people with different views. We reinforce a more siloed view of the world. The same thing can happen in real life when people move to a new neighbourhood. You are who you surround yourself with. Its human nature. You really need to force yourself to look outside that siloed view of the world. I discussed this in my video interview with Bronwen Clune, who was previously an editor at The Guardian. There’s a difference between what you want to know versus what you need to know. The role of traditional news should tell you what you need to know. We want to encourage a more balanced view of the world, including showing you the opposite view. We shouldn’t only recommend stories to you based on what you engage with. The rush for eyeballs should also be balanced with an obligation to inform & educate people. If we want to have worldly citizens, then we need to have a well rounded views. Showing you news only based on algorithms is a flaw. Media websites also look at how you come into the website and how similar people behaved. If someone came via a twitter link, they’ll show you news based on what others did that also came via the same twitter link that kept them engaged. On the flipside, if you have manual curation the editors can get it wrong because there’s a human behind the scenes. But I like the idea that Facebook’s trending news also has a component of manual curation. Perhaps the problem is that they have positioned it as trending news when in fact it isn’t all trending news items. The other issue is that they’re only adding liberal stories. Should libertarians also receive conservative news? I am in a privileged position to be an admin of the Sydney Startups Facebook Group. On a daily basis, we monitor the group which is approaching 5,000 members. I look at the items people are posting and see if they are relevant to the group. I can also delete items and promote them by pinning them for further discussion. I look at a number of factors in whether its trending via the number of likes or comments. I also will read the content to see if it high quality. Its easy to do it based on purely likes and comments and surface these news items only. It can also be gamed. Facebook also has its own algorithm for determining which items they highlight and show in your feed. I inject myself into the news by look at the content being posted and consider whether its something the community needs to know. Even if its not trending, I can promote it because I believe its valuable. 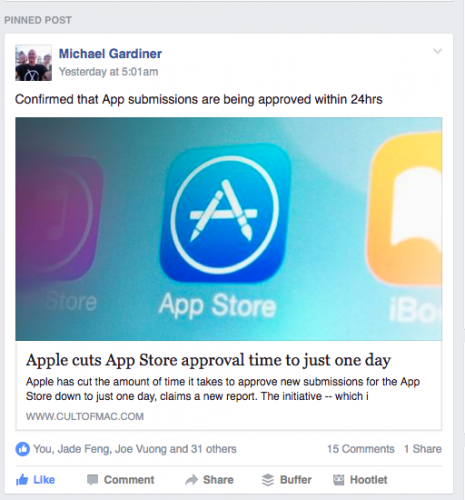 Recently, there was an article posted by Michael Gardiner of LimeRocket about how Apple app Store Submissions are approved within 24 hours. I believe that is great value to the community to know this. I also have an understanding for what will be popular as I monitor the things that I promote and what the group engages with. I do recognise that I’m also biased given that I work in the mobile industry. On balance, I believe that is better that I promote it than another article. If we can educate people about this update, then they’ll know about this critical change to the app store. They can speed up the velocity of their app updates.